These homemade shortbread cookies! They melt in your mouth and are perfectly buttery and milky. The first time I had them was at a family friend’s house. I wanted more… and more but there wasn’t enough to go round. So I started searching for the cookies in the stores because my taste buds were eager to enjoy some. The price at which they were sold could make me faint. 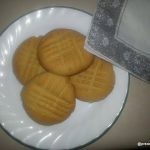 I believed it was so much money just for “biscuit.” But they taste really good and they are very rich so I understand but I couldn’t keep churning out all that money for shortbread cookies. I had to find a way to make mine. They are milky, buttery (did I already say that?) and just divine. I thought the recipe will include milk since they taste milky but nope, the very present milky taste comes from the butter. 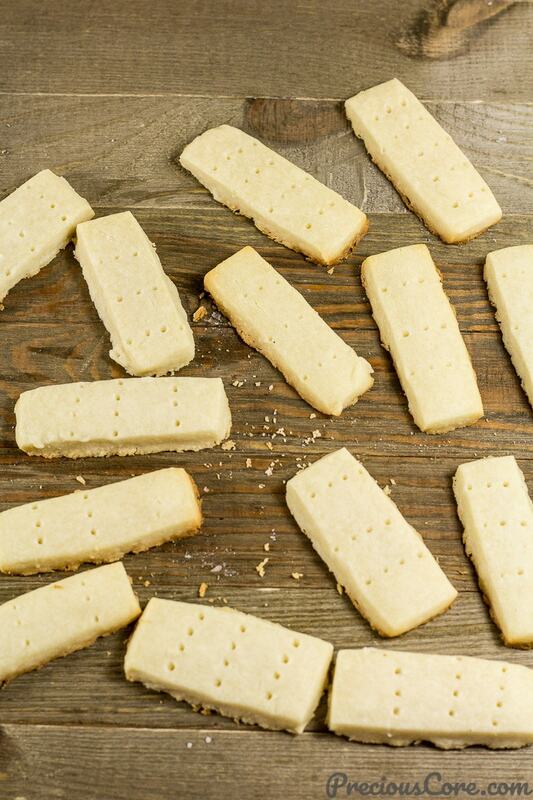 So no milk is needed in this shortbread recipe. The butter makes it taste milky because butter is dairy. Imagine my joy when I found out I could make them in my own kitchen! They are so easy to achieve. 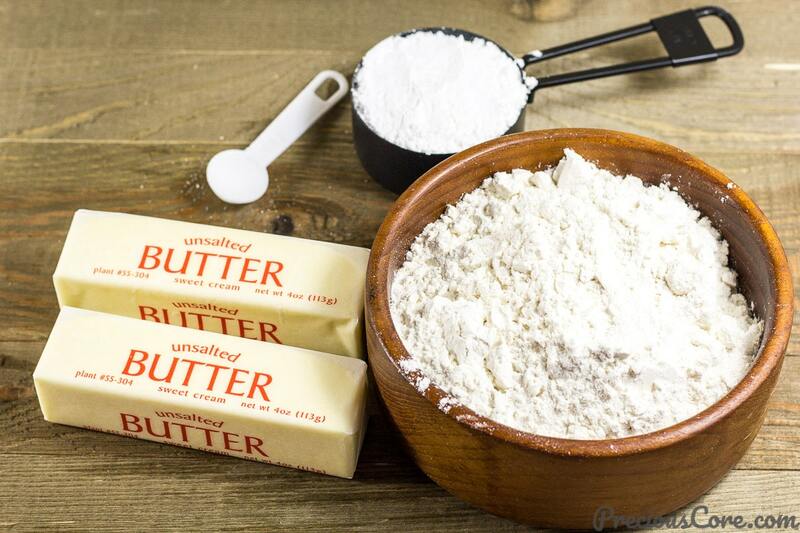 You only need 4 ingredients- sugar, unsalted butter, salt and flour. 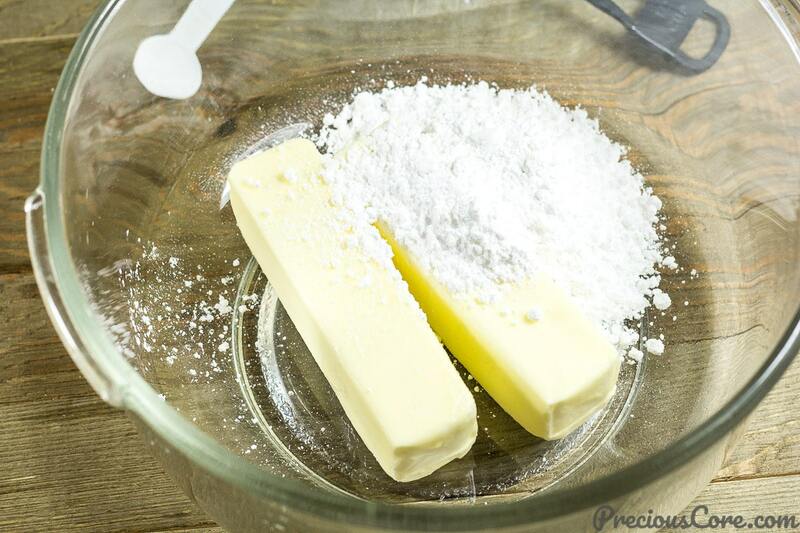 If you choose to use salted butter instead, omit the salt and that will be 3 ingredients! Line one large or two medium baking trays with parchment paper and set aside. Step 1: Put butter and sugar in a bowl. Step 2: Cream together until well incorporated. Step 3: Sieve in your flour. Then add a pinch of salt. Step 4: Mix together. The mixture will be slightly tough. Just try to get everything together. Step 5: Now mold into a ball. 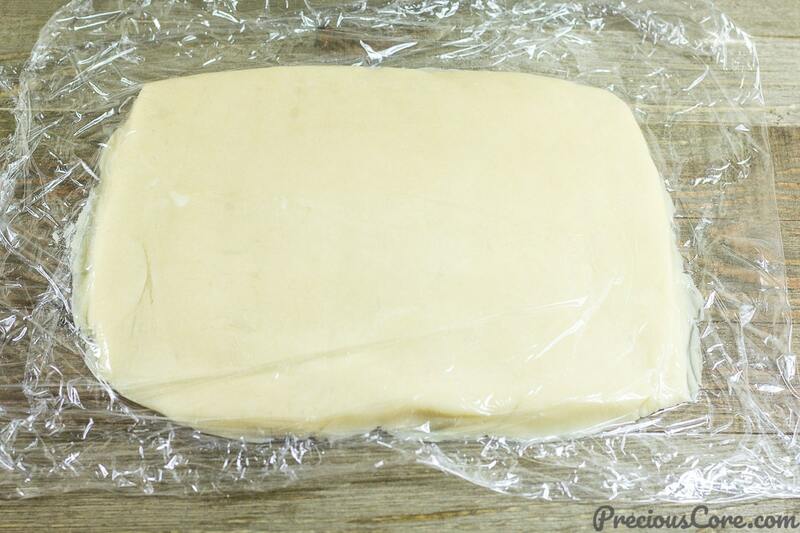 Step 6: Wrap dough in a plastic wrap and try to form it into a rectangle as much as you can. It should be about half an inch thick. Step 7: Now place the dough in a fridge and let it cool for about 30 minutes. You need to do this so you can shape your cookies properly. Take it out and roll out to about a quarter inch thick. Leave the plastic wrap on while doing this. Step 8: Take off the plastic wrap and trim the edges to form a rectangle… or something in the form of a rectangle. Ha. Cut out into little rectangles – about 2-4 inches long. If you have a cookie cutter, you could just use it to cut to desired shapes. Join together your trimmed edges to form a ball, roll it out and cut out more cookies. Note that if your dough starts feeling melty (butter will melt fast if the atmosphere is warm), put it in the fridge to harden for a few minutes then you take it out and continue. You can also place the cookies in the fridge for about 10 minutes before baking if they feel too soft. 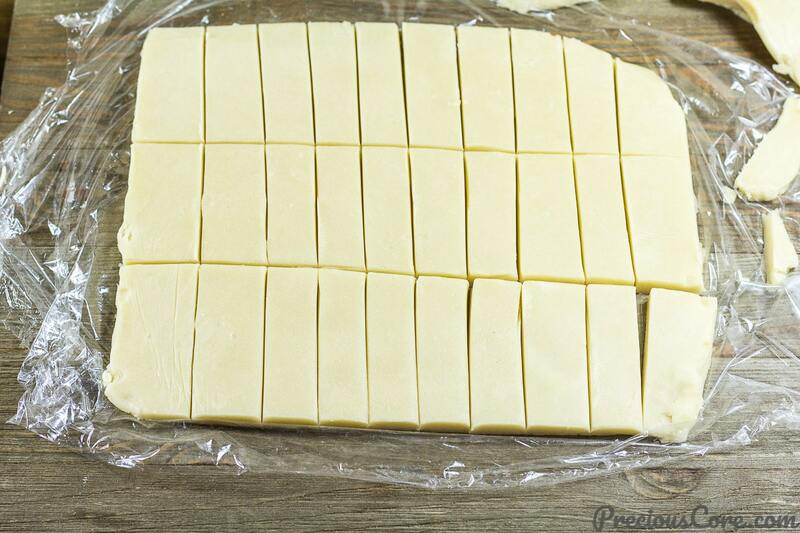 Step 9: Place your cuts your prepared baking tray. Use a fork to poke each piece a couple of times. Step 10: Now bake in the oven for about 10 minutes or until light brown in color. Note that your shortbread cookies will be slightly soft once they come out of the oven. But that’s okay. They will firm up as they cool down. Avoid moving them around while they are very hot so you don’t break them. Enjoy your shortbread cookies with tea if you like! 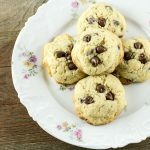 These homemade shortbread cookies are great for Christmas, New Year, Valentine’s Day or any celebration! If you would love to store some, be sure to keep the cookies in an airtight container so they don’t get bad. Check out the full printable recipe below! 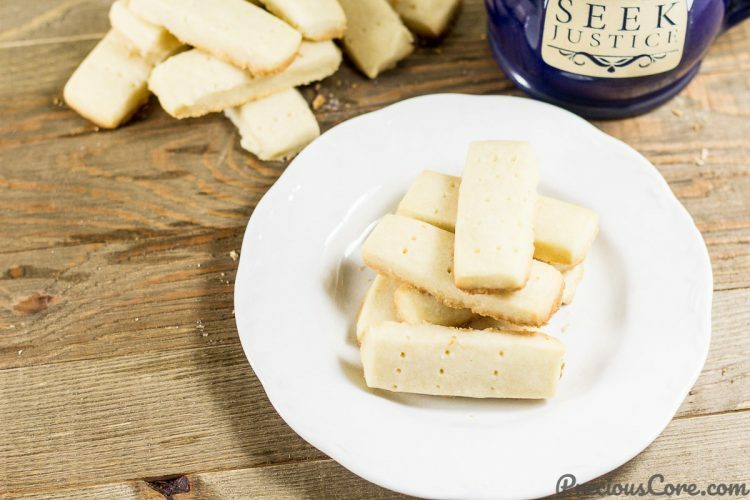 These Homemade Shortbread Cookies melt in your mouth when you try them. 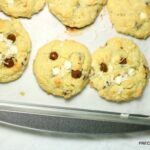 They are so milky and buttery, not overly sweet and easy to make at home. 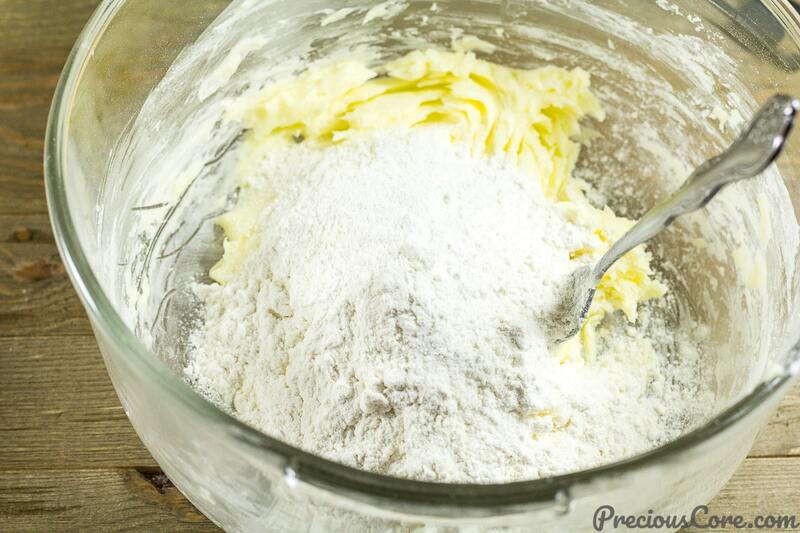 Only 4 ingredients needed for shortbread cookies! 1 cup unsalted butter (453g) it has to be butter and not margarine. Preheat your oven to 350 Degrees Farenheit. Grease a baking tray or line with parchment paper and set aside. Put room temperature butter and sugar in a bowl. Use a fork or wooden spoon to mix together until well combined. Add in half of your flour and the salt. Mix together. The mixture will be very crumbly at this stage. 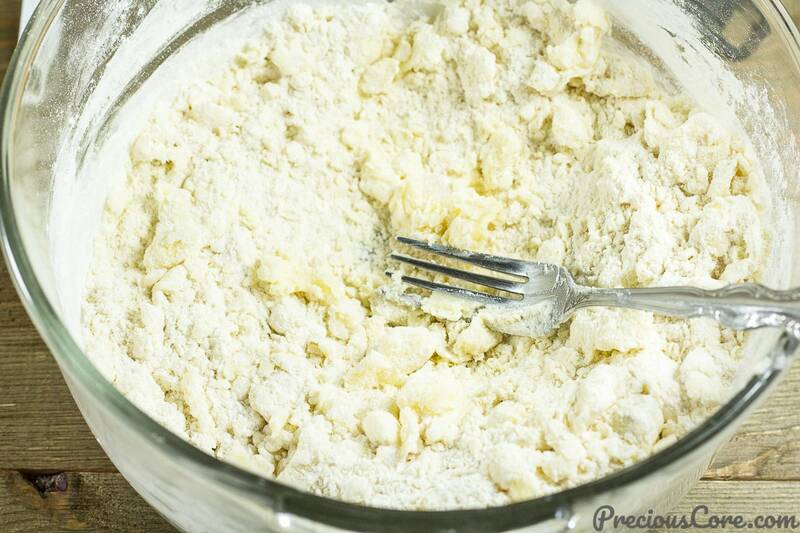 Add in the remaining flour and mix well. Use your hand to combine everything to form a ball of dough. 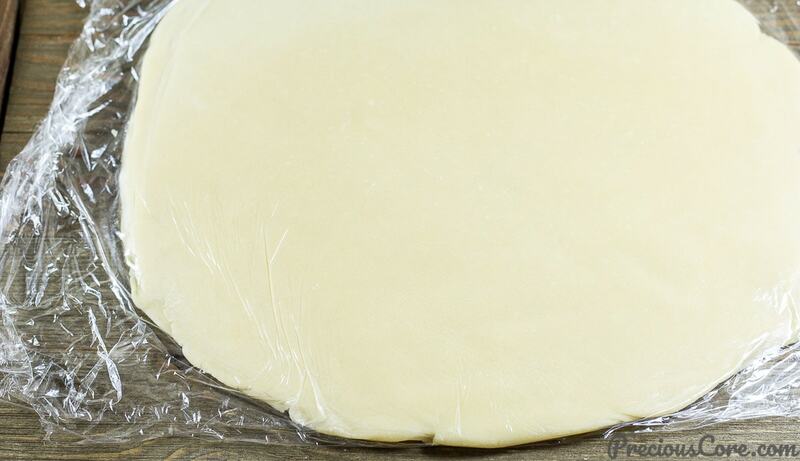 Wrap dough in a plastic wrap and try to form it into a rectangle as much as you can with your hand. It should be about half an inch thick. Now place the dough in a fridge and let it cool for about 30 minutes. You need to do this so you can shape your cookies properly. While the dough is in the fridge, preheat oven to 350 degrees F (180 degrees C).Take out dough and roll with a rolling pin to about 1/4 inch thick. Leave the plastic wrap on while doing this. Now open the wrap then you cut the dough into rectangles. If you have a cookie cutter, you could just use it to cut to desired shapes. 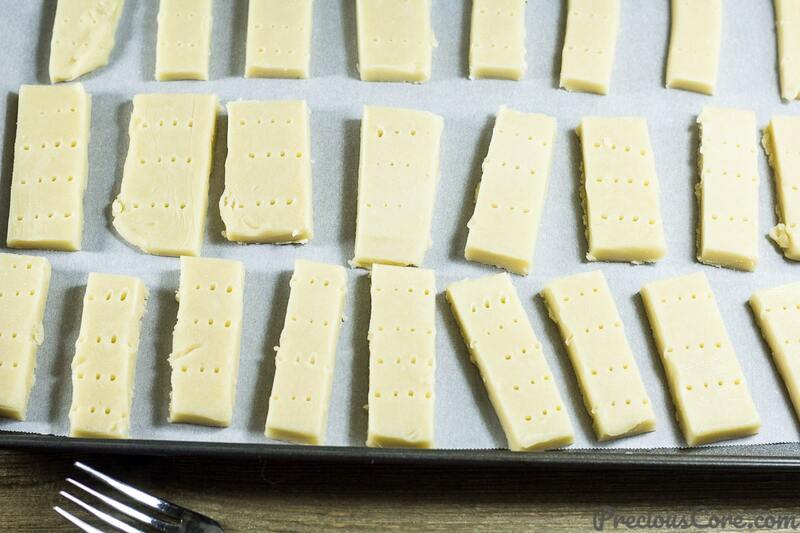 Place your cuts on trays lined with parchment paper. Use a fork to poke each piece a couple of times. Now bake in the oven for about 10 minutes until light golden in color. 1. Note that your shortbread cookies will be slightly soft once they come out of the oven. But that's okay. They will firm up as they cool down. Avoid moving them around while they are very hot so you don't break them. 2. 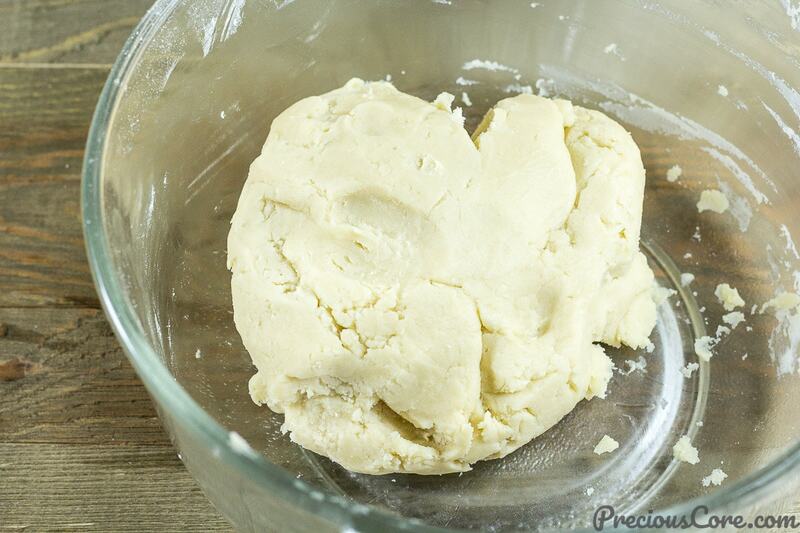 If you make your shortbread cookies in a hot environment, the dough might feel very soft due the butter melting. In that case, place the dough in the fridge for about 10 minutes to harden then you continue working with it. The cookies should be firm before you place them in the oven. This will prevent them from burning too quickly. If you notice they are soft, place them in the fridge for about 10 minutes then proceed with baking. 3. 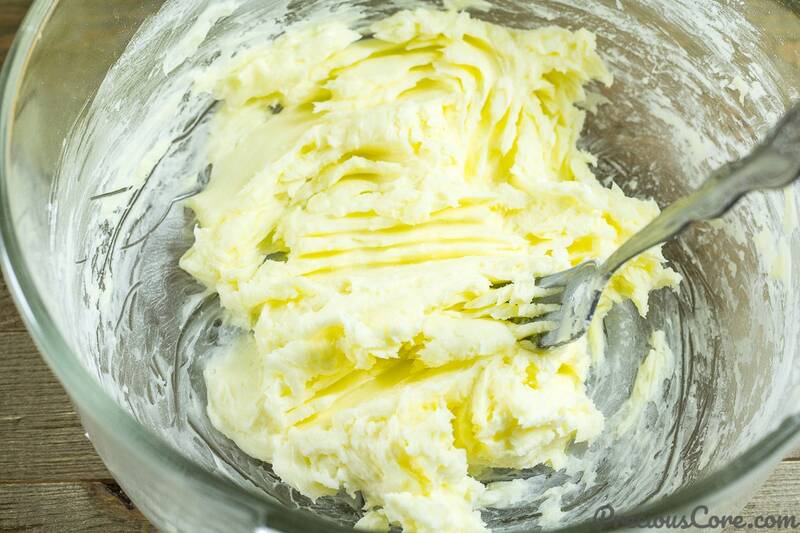 You could use salted butter instead of unsalted butter. If you choose to do so, omit the salt in this recipe. 4. 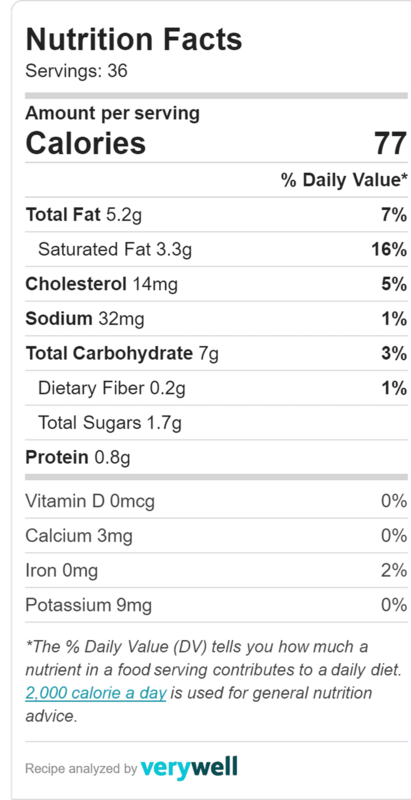 The nutritional information here is per cookie. 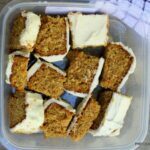 *This recipe has been updated with new pictures, doubled measurements, nutritional information and lots of tips. I will be waiting for the updates seriously oo. Thanks dear. Please do. They are worth trying. When i first saw this recipe, hmmm!!! I was a little defeated. But when i tried it, OMG! It was awesome. Thank you Pre for the recipe. A great job you are doing there Precious. I wish you more elbow grease and a never failing grace from above. Awww thank you so much, Pat! Please let me know how it goes, Chinwe. thanks a lot for your recipe. Am so in for trying it. What’s the equivalence of 1cup of flour in Kg? Can we also use the normal powdered sugar or must be icing sugar?? Hi Kiya, 1 cup of flour equals 125grams. I’ve never tried it with regular sugar before so not sure how that will turn out. Wow thanks alot. I’m so going to try this. But I have a question please, can one replace icing sugar with our normal sugar? Yes dear, you can use normal sugar. Hope you enjoy the recipe, Timi. Hello, I love your blog first of all. Can I add milk to the mixture? Hi Temi, you do not need to add any milk to the mixture. The cookies will taste very milky without added milk. The milky taste is from the butter which is equally a dairy product. Hello Precious, I followed this recipe and my short bread came out like a pro. I stored in an airtight container and kept in the fridge . Everybody who had a taste of it asked for more lol. Thanks plenty. Yes! This makes me so happy, Princess. Thanks for sharing! My dearest Sister Precious, happy new year. 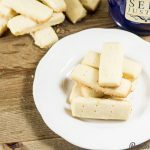 Short bread cookies makes the list as one of my favorite snack, it tastes buttery, milky in the mouth and quickly satisfies me. May I atleast get to know how to bake like you in this new year. Even if it’s just 20% lol. Happy new year to the girls and to your hubby. You know I love you like a Sister. Lol at 20%! Baking is not hard, dear. Just follow the directions and you will be fine. Happy new year to you! Thanks very much for your recipes ma’am, they’ve been of great help to me, I’m sure going to wow my hubby with this one today. I tried your meat pie recipe the other day and it left my son coming back to the kitchen every 30mins for more. The entire family enjoyed it. 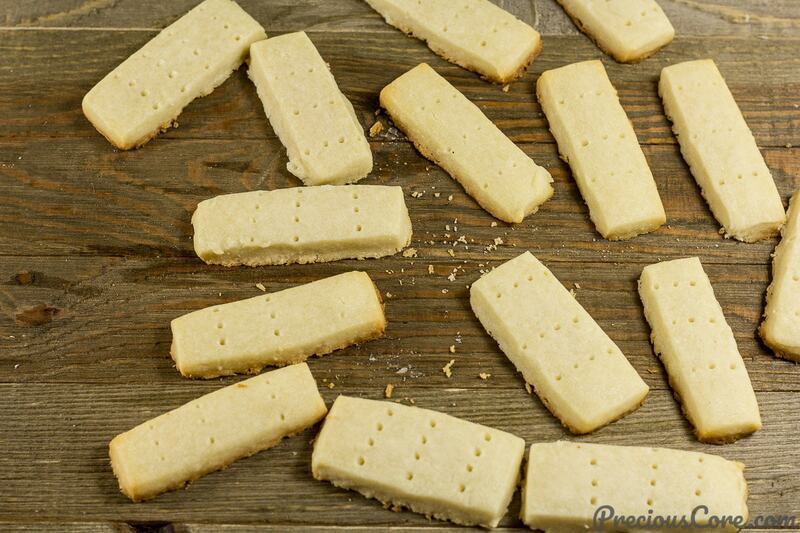 I’m getting into my kitchen right to try this shortbread recipe. Good day Sister precious, I’m so happy to see this, pls what will happen to ur cookies, if u add milk on it. Hi Ebele, for this recipe, the dough will be too soft if you add milk.